“Mom, I am not a kid anymore. And why you always say I would feel left out, God knows. Now please go and catch some sleep Mamma. You look so tired”, Advika said. “Oh Mamma! I didn’t hide anything. Anyway it’s already late and I am feeling sleepy. Good night Mom”, saying so Advika wrapped herself with the blanket and dozed off. Bharati turned off the lights and went out of the room. Advika is presently a student of 11th standard from R.L. International High School. She is quite a bright student who not only excels in her studies but also extremely passionate about singing. She has a melodious voice that had won awards from quite a few competitions before. The very first person who inspired her to sing was her mother Bharati. She wants to see her daughter as a renowned singer in future. She is the one who enrolled her in one of the best music training schools of the city when Advika was barely six years old. Bharati personally ensures that her daughter regularly did her “riyaaz”. She would sit in front of her daughter closing her eyes while Advika’s fingers deftly moved back and forth the keys of the harmonium and her voice presented itself as a treat to anyone’s ear who heard it. Despite being a popular singer, Advika does not have friends. She sits in one corner of her classroom, the adjoining seat usually left vacant. She eats her lunch alone and hardly talks with anyone without a purpose. Not that she is reserved but she is not allowed to be friendly. Bharati has a weird nature that does not permit her daughter to keep friendship with anybody. She fears that Advika would abandon her just like everyone else in her life so far. Therefore she puts her best efforts to shun anyone who comes to her daughter’s vicinity that eventually has resulted in a void within Advika’s heart which Bharati has failed to fill up. Bharati’s life so far has been one replete with neglect, scorn and mockery. Her parents passed away when she was barely seven years old leaving her in the custody of her uncle and aunt. They treated her like no less than a servant causing her grief to proliferate within her with every passing year. Her own brother who was five years elder to her had left home after he turned sixteen in search for a job. He never returned. Bharati had developed a likeness towards singing since she was young. She would watch her cousin sister practise “riyaaz” and would be awed at it. She would sometimes dream of a huge concert hall teeming with thousands of people awaiting her arrival. She would gracefully walk up to the podium dressed in a red silk gown, her hair cascading down her shoulders and carrying a small microphone in her hand. The crowd would stand up to applaud her once she appeared before them. She would then begin, “Good evening to all. My sole inspiration has always been the lady who created me, my mother. I……………..”. “Get up Bharati. Are you still sleeping, huh? The sun is about to set and you seem to be lost in your dream. Start preparing some snacks for your uncle. He will return from office early today”, Bharati’s aunt would be shouting. Bharati would jerk herself up from the reverie and quickly move to the kitchen. She was hardly seventeen years old when his uncle, keen on relieving himself of a burden, got her married off to Sushanta who worked as a clerk in a government office. Sushanta proved to be a doting husband. He successfully filled the void in her heart with unconditional love. They were soon blessed with a baby girl. Bharati named her “Advika” meaning one who is unique. Bharati had just begun to love her life when she was again struck with grief. 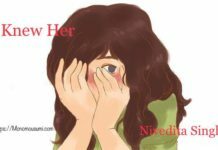 She still remembers that evening when Manoj, Sushanta’s colleague had come running to her place. She was holding Advika in her arms while Manoj informed that Sushanta had met with an accident and was no more. Bharati clutched her baby daughter close to her chest while her eyes refused to hold back the tears that were too ready to gush out. From that day onwards, Bharati began to fear that her daughter whom she loved more than anybody else would also leave her someday just like others. She began to believe that she was born to be abandoned, to be left out. This led to her being over possessive with Advika that proved to be a bane rather than a boon. “Mamma, I will be late today. We are planning to have a group study after the coaching class is over”, Advika said. “From when have you started doing your so-called “group studies”? You don’t have friends, do you?” asked Bharati. They were walking down the desolate lanes of Ganpati Nagar when Yogesh suddenly held her hands. Advika was too astonished to react initially but soon managed it with a coy smile. “So, what story did you frame today?” Yogesh asked. “And she believed it?” Yogesh looked stunned. “From when have you started taking my permission?” Yogesh smiled. Advika has known Yogesh for almost a year now. They are in the same class but different sections. The thing that drew Advika towards Yogesh was his passion for music. He himself could play a number of instruments that ranged from guitar, keyboard, flute, santoor and drums. The fact that Advika never speaks to anyone without a purpose made Yogesh quite hesitant to approach her in the beginning. He was able to observe the melancholy in her eyes that was also sometimes reflected in her voice and was thus eager to unravel its cause. He provided him an abode of friendship where she could pour her heart out without being suspected and misjudged. It was a Monday morning. Bharati was in her daughter’s room arranging her study table. Advika had gone to her Music Training School. Her examinations were over the previous week and 12th standard classes were to begin a couple of weeks later. She thought it better to continue her music classes even in the weekdays so that she would get some extra time to rehearse for the upcoming Annual function. “Why can’t she just arrange her books and keep? The table looks immensely dirty”, Bharati exclaimed. She pulled out the drawer to put the pens when she saw a book with a brown cover inside. She was curious. She took it out and opened. No, it wasn’t just a book, it was a scrapbook! “Mummy”, Advika entered the house running. She was beside herself with joy. She shouted again. “Mamma….where are you? I am so happy. Mamma come here.” Bharati appeared with a face reddened with an uncontrollable rage. Advika was too overjoyed to notice. She continued. “Mamma I am going to sing your favourite song, “Meri awaaz”. Sunita Mam said. I am so excited Mamma. She said I could “carry off the notes quite well”. Oh! Mamma”, saying so she hugged her mother. “Who is Yogesh?” Bharati asked calmly. Advika shook with utter bewilderment. Bharati brought the scrapbook and held it in front of her daughter. “What is this? Are you in a relationship? Does the boy love you? He can’t. Nobody can, except me. Do you understand?” Saying so, Bharati tore the scrapbook into bits leaving her daughter to shudder with every bit falling onto the floor. Bharati went further to meet Yogesh after school and warned him not to keep any contact with her daughter or else he would complain against him to the school Principal. That marked an end of the budding love that was gradually trying to set free an encaged soul but in vain. Advika was determined to pursue her higher studies away from home despite Bharati’s repeated plea. All Advika wanted was to be away from her mother and live by herself. She was too suffocated to breathe. When Bharati came to know that Advika had enrolled herself in a city college far away from their small town she felt a lump in her throat. She had almost begged Advika to stay back but unfortunately to no avail. Advika packed her bags and set off. “Why do you keep asking the same questions every day? Don’t you get bored? You know what the main thing is you don’t have anything else to talk to me. Let’s do something. Let’s just talk once a week. You will have something other than my meals to inquire about.” Advika was irritated. Advika slammed down the phone while Bharati stood in her room motionless and bathing in tears. Bharati was finding it immensely difficult to come to terms with the fact that Advika had grown up. She needed her own space. She needed to be independent. Bharati failed to understand and instead created in her mind a picture which could be nowhere close to reality. She started to believe that Advika has left her already and she was all alone. Advika, the apple of her eye, is taken, taken by someone else. The deeper Bharati thought, the more she passed herself into a state of severe dejection. As days and months passed by Advika stopped calling her. If Bharati called her, she would not respond. Advika even rarely visited her home nowadays. She preferred to stay back at the hostel even during the vacations. She would be too busy either with her semester or her music concerts. Advika was gradually turning into a budding singer, just like what her mother had aspired for. Back at home Bharati gradually pushed herself further and further into utmost depression which her daughter, Advika had absolutely no idea of. Advika was in midst of a rehearsal when her phone rang. She was one of the five singers selected to perform at a concert that was to be held at Mumbai the following month. There would be present renowned singers and music directors. Who knows if luck favours she might even end up with a proposal to work with one of them. She was over the moon with joy. She looked at her phone. It was her uncle, Prabhat. “Why on earth is he calling me now?” she wondered within. Being not ready to even waste a second of her rehearsal she ignored the call and put her phone on silent mode. Prabhat had called her twenty five times more. “Hello, uncle. What happened? Actually I was in the middle of a rehearsal so…..” Advika spoke over the phone. “When have you last spoken to your Mom?” Prabhat asked. The concert hall was teeming with thousands of people awaiting her arrival. Advika gracefully walked up to the podium dressed in a red silk gown, her hair cascading down her shoulders and carrying a small microphone in her hand. Her melodious voice echoed through. And when she finally ended with “Meri awaaz”, Bharati’s favourite song, the crowd stood up for a huge round of applause. Bharati, although not realising who sang yet joined in. Advika brought the microphone close to her mouth and began, “Good evening to all. Thank you all so much for your support. My sole inspiration has always been the lady who created me, my mother. I……………..” No, she couldn’t finish. Tears gushed down her cheeks as she hurried down the steps of the podium to embrace her mother. Author Bio : Ayentika Sen is currently a resident of Mumbai and working as a Scientific Officer under Department of Atomic Energy. Writing isn’t her profession; it is her passion. She dreams of reaching out to the society someday and probably make a difference by letting her words read since it is well-known that “Pen is mightier than a sword”. Note : Ayentika Sen is the WINNER ( Story Writing Category) of Quaterly Creative Writing Competition (OCT_DEC,2018) organized by #Monomousumi.